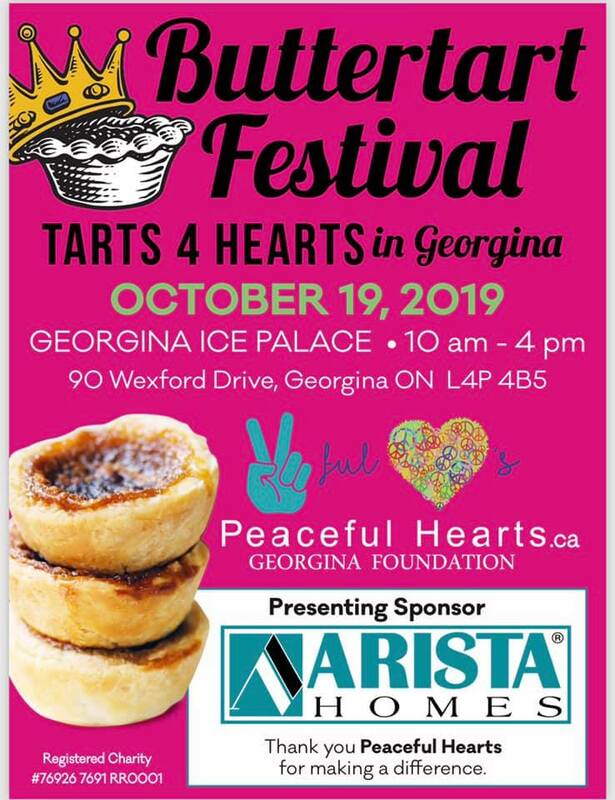 You will not want to miss the 2nd Annual Peaceful Hearts Tarts 4 Hearts Buttertart Festival. Last year this incredible happy event SOLD OUT of 8000 buttertarts in 3 hours. This year we have double the SUGARY goodness. We are so pleased and proud to bring this event to the Town of Georgina that supports our special needs community along with enriching our local tourism. This event brings Ontario bakers and thousands of tarts, amateur baker contest, musical entertainment, shop a busy market with retailers, artisans, café and food. There will be a state of the art Accessibility Washroom Trailer on site and includes extra wide aisles for wheelchair access. Admission – $1 for adults/ FREE up to 18 years. SPECIAL NEEDS AND CAREGIVERS ENTER AT NO CHARGE. This year we are looking forward to also be able to support a local organization within our community, more information will be released, stay tuned for updates.